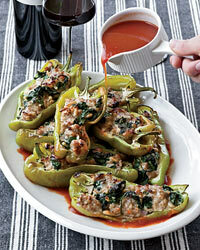 New York City's Torrisi Italian Specialties uses only American ingredients in virtually all of its dishes. 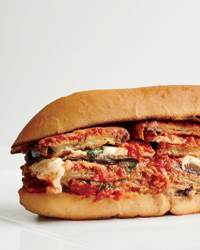 Its basil-rich eggplant parmesan, also delicious on a toasted roll, calls for Progresso Italian Style bread crumbs and SarVecchio parmesan from Wisconsin. Pairing: Medium-bodied, cherry-rich Barbera d'Alba: 2008 Massolino. "I may never use ground meat in my peppers again," said Fran Parisi, Grace Parisi's mother, when she tried this super-flavorful sausage-stuffed version. Another revelation: Smaller Italian frying peppers are much easier to brown in a skillet than the typical green bell peppers, and they also cook faster. Pairing: Spicy, concentrated Montepulciano d'Abruzzo: 2007 Zaccagnini Riserva. 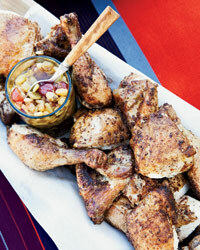 Ben Towill hand-crushes grapes for this fresh salsa, but pureeing some of them in a food processor works equally well. 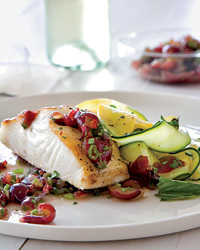 Grapes may seem like an unlikely partner for fish, but they're very good with silky black cod fillets. Pairing: Peach-inflected southern French white: 2009 Domaine La Suffrène Bandol or 2009 Château Massiac Viognier. "Brining isn't imperative," says Michael Chiarello, "but it adds juiciness." Before roasting, he rubs the brined birds with a spice mix and brushes them with butter; the flavors are even better at room temperature, making this a stellar picnic dish. Pairing: Sonoma Coast Pinot Noir: 2007 Whetstone Bella Vigna. At Canlis, Jason Franey serves lamb two ways (as a ragout and as chops) with two sides (potato puree and Israeli couscous). 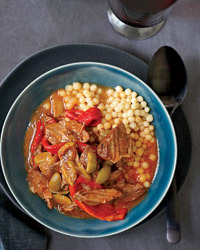 But the ragout and couscous are amazing on their own, and less work to make. Pairing: Syrah: 2006 Buty Peter Canlis.